"4000 lbs. 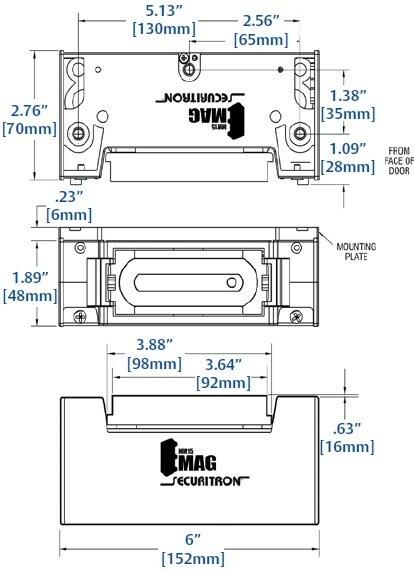 Holding Force Maglock"
- Select Function: MM15, MM15DT, MM1G, or MM15GDT. - Delivery: The Securitron MM15 MEMLOCK is factory-ordered, please allow 3-4 working days' lead time. Unique Hybrid Design, Two Tons of Holding Power! The hybrid design of the MM15 includes two springloaded, hardened steel jaws that deliver up to 4000 lbs. of ultimate holding power. In a forced-entry assault, the jaws clamp down on the armature plate and hold firm, for an unmatched level of access control. 4000 lbs. holding force dual voltage, dual current Maglock for interior or perimeter doors where ultra-high security and compact size are required. Note: MM15 finishes are determined by snap-on metal dress covers. The Brushed Stainless dress cover is provided standard with the MM15. Black, Polished Brass, and Satin Brass dress covers must be purchased separately. - 4000 lbs. holding power. - Mounting plate for easy, accurate installation. - Automatic dual voltage (12/24V). - Accepts AC or DC current. - Ideal for mental health care and auxiliary detention facilities and other high-risk locations. - Architectural brushed stainless steel finish (US26D/626). - Optional finishes via dress cover. See "Related Items" above. - UL 10C Listed, 1 hour. (G) Gate Conduit: The conduit fitting is offered on some Magnalocks that can be used for gate-mounting applications and features an outer diameter and inner diameter.